For one week only, Crystal’s Unicorn will be just 99 cents!!! Starting March 23rd at 8 a.m. for three days only, Don’t miss out!!!! You still have a chance to grab it on the March 26th at 4PM it will go to 1.99, so do not pass this up! As the sea began to consume the setting sun in the distance Franco sat on the rocks starring into the waves that were tumbling against the sand.The cold winter air nipped at his face.The beach was his favorite place to think. To be as one nature. Franco had not set foot inside of a church or even prayed since he blamed God for taking Maria away from him six years ago. Franco banged his open hands against the wet sand. Digging his fingers into the wet sand he closed his hands full around the sand. His anguished body wrenched into a ball screaming from the pain. With one final feral scream he stood ripping away his shirt as his wings tore through his skin. Pulling back from, he looked into her eyes with a fierce look of tenderness. “After this, there is no turning back. But if you need me to stop, you only have to say so and I will.” Searching her eyes, he felt his mind begging her to not tell him no. He knew he would not be able to handle it. He could stop. But his hunger for her was nearly unbearable. She was his from the moment he laid eyes on her, he felt childish in thinking so, but he knew it to be the truth, she was his and he was hers. 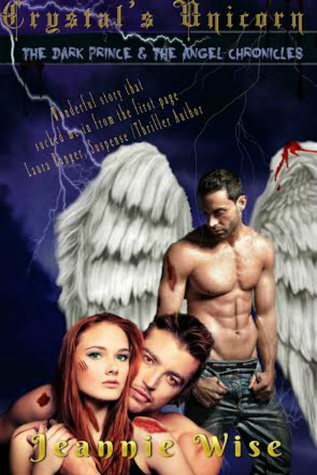 This entry was posted in Blog Tour, Paranormal, Romance and tagged angels, crystal's-unicorn, jeannie-wise, paranormal-romance, vampires.